Stephen Martin Walt (born July 2, 1955) is an American professor of international affairs at Harvard University's John F. Kennedy School of Government. He belongs to the realist school of international relations. He made important contributions to the theory of defensive neorealism and has authored the balance of threat theory. Books he has authored (or co-authored) include Origins of Alliances, Revolution and War, and The Israel Lobby and U.S. Foreign Policy. Walt was born in Los Alamos, New Mexico, where his father, a physicist, worked at Los Alamos National Laboratory. His mother was a teacher. The family moved to the Bay Area when Walt was about eight months old. Walt grew up in Los Altos Hills. Walt pursued his undergraduate studies at Stanford University. He first majored in chemistry with an eye to becoming a Biochemist. He then shifted to history, and finally to International Relations. After attaining his B.A., Walt began graduate work at UC Berkeley, graduating with a M.A. in Political Science in 1978, and a Ph.D. in Political Science in 1983. Walt taught at Princeton University and the University of Chicago, where he served as Master of the Social Science Collegiate Division and Deputy Dean of Social Sciences. As of 2015, he holds the Robert and Renee Belfer Professorship in International Affairs in the John F. Kennedy School of Government at Harvard University. Walt was elected a Fellow in the American Academy of Arts and Sciences in May 2005. He spoke at the Saltzman Institute of War and Peace Studies at Columbia University in 2010. In 2012, Walt took part in a panel at the one-state solution conference at the Kennedy School, along with Ali Abunimah and Eve Spangler. Walt spoke at Clark University in April 2013. He gave a talk at the College of William and Mary in October 2013 about "Why US Foreign Policy Keeps Failing." He delivered the 2013 F.H. Hinsley Lecture at Cambridge University. In a comprehensive 2005 article, "Taming American Power", Walt argued that the US should "make its dominant position acceptable to others – by using military force sparingly, by fostering greater cooperation with key allies, and, most important of all, by rebuilding its crumbling international image." He proposed the US "resume its traditional role as an 'offshore balancer'", intervening "only when absolutely necessary" and keeping "its military presence as small as possible." In a late 2011 article for The National Interest entitled "The End of the American Era", Walt wrote that America is losing its position of world dominance. Walt gave a speech in 2013 to the Norwegian Institute for Defence Studies entitled "Why does US foreign policy keep failing?" The Institute later described him as seeing "an overwhelming bias among US foreign policy institutions toward an activist foreign policy" and "a propensity to exaggerate threats, noting the chances of being struck by lightning have been far greater since 2001 than death by terrorist attack." He also characterized the US as lacking "diplomatic skill and finesse" and advised Europeans "to think of themselves and not rely on the US for guidance or advice on solving their security issues." Ultimately, he argued, "the United States is simply not skilled enough to run the world." "Why are Americans so willing to pay taxes in order to support a world-girdling national security establishment," asked Walt in 2013, "yet so reluctant to pay taxes to have better schools, health care, roads, bridges, subways, parks, museums, libraries, and all the other trappings of a wealthy and successful society?" He said this question was especially puzzling given that "the United States is the most secure power in history and will remain remarkably secure unless it keeps repeating the errors of the past decade or so." A critic of military interventionism, Walt stated, "Hawks like to portray opponents of military intervention as 'isolationist' because they know it is a discredited political label. Yet there is a coherent case for a more detached and selective approach to U.S. grand strategy, and one reason that our foreign policy establishment works so hard to discredit is their suspicion that a lot of Americans might find it convincing if they weren't constantly being reminded about looming foreign dangers in faraway places. The arguments in favor of a more restrained grand strategy are far from silly, and the approach makes a lot more sense to than neoconservatives' fantasies of global primacy or liberal hawks' fondness for endless quasi-humanitarian efforts to reform whole regions." In 1998, Walt wrote that "deep structural forces" were "beginning to pull Europe and America apart." Walt argues that NATO must be sustained because of four major areas where close cooperation is beneficial to European and American interest. Defeating international terrorism; Walt sees a need for cooperation between Europe and the United States in managing terrorist networks and stopping the flow of money to terror cells. Limiting the spread of weapons of mass destruction; Walt argues that anti-proliferation efforts are most successful when Europe and the U.S. work in concert to bring loose nuclear material into responsible custody. He cites the case of Libya's willingness to abandon its nascent fission program after being pressured multilaterally as evidence of this. Managing the world economy; lowering barriers to trade and investment particularly between the U.S. and the E.U. will accelerate economic growth. Notable differences in trade policy stem mainly in areas of agricultural policy. Dealing with failed states; failed states are breeding grounds for anti-Western movements. Managing failed states such as Afghanistan, Bosnia and Somalia require a multinational response since the U.S. has insufficient wealth to modernise and rebuild these alone. In this area European allies are especially desirable because they have more experience with peacekeeping and "nation-building". Walt believes extending invitations for NATO membership to countries in the former Soviet bloc is a "dangerous and unnecessary goal" and that nations such as Ukraine ought to be "neutral buffer state(s) in perpetuity". From this perspective, he believed that arming Ukrainian armed forces after the annexation of the Crimea by Russia "is a recipe for a longer and more destructive conflict." Walt said in December 2012 that America's "best course in the Middle East would be to act as an 'offshore balancer': ready to intervene if the balance of power is upset, but otherwise keeping our military footprint small. We should also have normal relationship with states like Israel and Saudi Arabia, instead of the counterproductive 'special relationships' we have today." An article by Stephen Walt, ″What Should We Do if the Islamic State Wins? Live with it″, appeared on June 10, 2015 in Foreign Policy Magazine. He explained his view that the Islamic State is unlikely to grow into a long-lasting world power on Point of Inquiry, the podcast of the Center for Inquiry in July 2015. Walt has been a critic of the Israel lobby in the United States and the influence he says it has on foreign policy. He wrote that President Obama erred by breaking with the principles in his Cairo speech by allowing continued Israeli settlement activity and by participating in a "well-coordinated assault" against the Goldstone Report. Walt suggested in 2010 that, owing to State Department diplomat Dennis Ross's alleged partiality toward Israel, he might give President Obama advice that was against US interests. Robert Satloff, executive director of the Washington Institute for Near East Policy (WINEP), defended Ross and criticized Walt, in a piece published by Foreign Affairs (which had published Walt's piece a few days earlier). Satloff wrote that Ross's connection to WINEP is innocuous (Ross was a distinguished fellow at WINEP throughout George W. Bush's administration, and Mearsheimer and Walt's book described WINEP as "part of the core" of the Israel lobby in the United States) and that Walt mistakenly believes the U.S. cannot simultaneously "advance strategic partnership both with Israel and with friendly Arab and Muslim states"
After the Itamar attack, in which a Jewish family was killed on the West Bank in March 2011, Walt condemned the murderers, but added that "while we are at it, we should not spare the other parties who have helped create and perpetuate the circumstances", listing "every Israeli government since 1967, for actively promoting the illegal effort to colonize these lands", "Palestinian leaders who have glorified violence", and "the settlers themselves, some of whom routinely use violence to intimidate the Palestinians who live in the lands they covet". Walt criticized the US for voting against a Security Council resolution condemning Israel's West Bank settlements, calling the vote a "foolish step" because "the resolution was in fact consistent with the official policy of every president since Lyndon Johnson." Walt has frequently criticized America's policy with respect to Iran. In 2011, Walt told an interviewer that the American reaction to an alleged Iranian plot to assassinate the Saudi ambassador in the United States "might be part of a larger American diplomatic effort to put Iran on the hot seat." "Washington continues to insist on a near-total Iranian capitulation," wrote Walt in December 2012. "And because Iran has been effectively demonized here in America, it would be very hard for President Obama to reach a compromise and then sell it back home." Walt said in November 2013 that "Americans often forget just how secure the United States is, especially compared with other states," thanks to its power, resources, and geography, and thus "routinely blows minor threats out of all proportion. I mean: Iran has a defense budget of about $10 billion...yet we manage to convince ourselves that Iran is a Very Serious Threat to U.S. vital interests. Ditto the constant fretting about minor-league powers like Syria, North Korea, Muammar al-Qaddafi's Libya, and other so-called 'rogue states.'" Therefore, whatever happens in the Middle East, "the United States can almost certainly adjust and adapt and be just fine." After visiting Libya, Walt wrote in Foreign Policy in January 2010 that while "Libya is far from a democracy, it also doesn't feel like other police states that I have visited. I caught no whiff of an omnipresent security service—which is not to say that they aren't there.... The Libyans with whom I spoke were open and candid and gave no sign of being worried about being overheard or reported or anything like that. ... I tried visiting various political websites from my hotel room and had no problems, although other human rights groups report that Libya does engage in selective filtering of some political websites critical of the regime. It is also a crime to criticize Qaddafi himself, the government's past human rights record is disturbing at best, and the press in Libya is almost entirely government-controlled. Nonetheless, Libya appears to be more open than contemporary Iran or China and the overall atmosphere seemed far less oppressive than most places I visited in the old Warsaw Pact." David E. Bernstein, Foundation Professor at the George Mason University School of Law, criticized Walt in 2011 for accepting funding from the Libyan government for a trip to Libya, where he addressed that country's Economic Development Board and then wrote what Bernstein called "a puff piece" about his visit. Bernstein said it was ironic that "Walt, after fulminating about the American domestic 'Israel Lobby'" had thus become "a part of the 'Libya lobby'". Bernstein found it ironic that "Walt, a leading critic of the friendship the U.S. and Israel, concludes his piece with the hope 'that the United States and Libya continue to nurture and build a constructive relationship.' Because, you know, Israel is so much nastier than Qaddafi's Libya." Under the headline "Is Stephen Walt Blind, a Complete Fool, or a Big Liar? ", Martin Peretz of the New Republic mocked Walt for praising Libya, which Peretz called a "murderous place" and for viewing its dictator as "civilized". Peretz contrasted Walt's view of Libya, which, Peretz noted, he had visited for less than a day. In August 2013, Walt argued that even if it turned out that Bashar al-Assad of Syria had used chemical weapons, the U.S. should not intervene. "Dead is dead, no matter how it is done", wrote Walt. Yes, "Obama may be tempted to strike because he foolishly drew a 'red line' over this issue and feels his credibility is now at stake. But following one foolish step with another will not restore that lost standing." In September 2013, Walt wrote an open letter asking his congressman to vote against a strike on Syria. Dr. Josef Olmert pointed out "at least two glaring inaccuracies", including Walt's failure to recognize that Syria is already a failed state and already riven by sectarian struggle, "something that 'realist' liberals find somehow hard to accept." Olmert noted that despite Walt's professed belief that Israel is at the center of all Middle East conflicts, Israel in fact has nothing to do with the conflicts in Syria, Egypt, Tunisia, or other countries in the region, which "are mostly the makings of the Arabs, ones which ought to be solved by them." Walt posits that offshore balancing is the most desirable strategy when dealing with China. In 2011 Walt argued that China will seek to gain regional hegemony and a broad sphere of influence in Asia which was comparable in size to the USA's position in the western hemisphere. If this happens, he predicts that China would be secure enough on the mainland to give added attention to shaping events to its favour in far flung areas. Given that China is resource poor, the nation will likely aim to safeguard vital sea lanes in areas such as the Persian Gulf. In a December 2012 interview, Walt said that "the United States does not help its own cause by exaggerating Chinese power. We should not base our policy today on what China might become twenty or thirty years down the road." Walt developed the 'balance of threat' theory, which defined threats in terms of aggregate power, geographic proximity, offensive power, and aggressive intentions. It is a modification of the "balance of power" theory developed by neorealist Kenneth Waltz. In July 2013, Walt argued that President Obama should give Edward Snowden an immediate pardon. "Mr Snowden's motives," wrote Walt, "were laudable: he believed fellow citizens should know their government was conducting a secret surveillance programme enormous in scope, poorly supervised and possibly unconstitutional. He was right." History, Walt suggested, "will probably be kinder to Mr Snowden than to his pursuers, and his name may one day be linked to the other brave men and women – Daniel Ellsberg, Martin Luther King Jr, Mark Felt, Karen Silkwood and so on – whose acts of principled defiance are now widely admired." In his 1987 book The Origins of Alliances, Walt examines the way in which alliances are made, and "proposes a fundamental change in the present conceptions of alliance systems." Revolution and War (1996) exposes "the flaws in existing theories about the relationship between revolution and war" by studying in detail the French, Russian, and Iranian revolutions and providing briefer views of the American, Mexican, Turkish, and Chinese revolutions. Taming American Power (2005) provides a thorough critique of U.S. strategy from the perspective of its adversaries. Anatol Lieven called it "a brilliant contribution to the American foreign policy debate." The Hell of Good Intentions: America's Foreign Policy Elite and the Decline of U.S. Primacy was published on 16 October 2018. In March 2006, John Mearsheimer and Walt, then academic dean of the Kennedy School of Government, published a working paper entitled "The Israel Lobby and U.S. Foreign Policy" and an article entitled "The Israel Lobby" in the London Review of Books on the negative effects of "the unmatched power of the Israel Lobby." They defined the Israel lobby as "the loose coalition of individuals and organizations who actively work to steer US foreign policy in a pro-Israel direction." Mearsheimer and Walt took the position that "What the Israel lobby wants, it too often gets." The articles, as well as the bestselling book Walt and Mearsheimer later developed, generated considerable media coverage throughout the world. Contending that Walt and Mearsheimer are members of a "school that essentially wishes that the war with jihadism had never started", Christopher Hitchens concluded that, "Wishfulness has led them to seriously mischaracterize the origins of the problem...." Former U.S. Ambassador Edward Peck wrote the "tsunami" of responses condemning the report proved the existence of the lobby and "Opinions differ on the long-term costs and benefits for both nations, but the lobby's views of Israel's interests have become the basis of U.S. Middle East policies." Walt is married to Rebecca E. Stone, who ran for Massachusetts House of Representatives in the 2018 election. The couple has two children. ^ Walt, Stephen. "Is Barack Obama More of a Realist Than I Am?". Foreign Policy. Archived from the original on 2015-10-25. Retrieved 2015-10-27. ^ a b "Harvard Kennedy School - Stephen Walt". Harvard Kennedy School. Archived from the original on 2015-09-24. Retrieved October 26, 2015. ^ a b "Stephen M. Walt Interview (2005)". Conversations with History; Institute of International Studies, UC Berkeley. Archived from the original on 2016-03-04. Retrieved 20 December 2013. ^ a b c "FORA.tv Speaker- Stephen M. Walt". Fora.tv. Archived from the original on 2013-12-27. Retrieved 20 December 2013. ^ "Third Annual Kenneth N. Waltz Lecture in International Relations with Dr. Stephen Walt "Realism and American Grand Strategy: The Case for Offshore Balancing"". Institute of War and Peace Studies. November 2010. Archived from the original on 2011-12-12. Retrieved 20 December 2013. ^ "Al Jazeera America Debut Featuring Stephen Walt Casts Doubt Over Network's Objectivity". Anti-Defamation League. Archived from the original on 2013-12-27. Retrieved December 20, 2013. ^ "Harrington lecturer Walt explores curse-worthy U.S. foreign policy". Clark University. April 23, 2013. Archived from the original on 2013-12-27. Retrieved December 20, 2013. ^ Caldwell, Priscilla. "Harvard Professor and Foreign Policy Blogger Stephen Walt to Present at William & Mary Sadler Center". College of William and Mary. Archived from the original on December 27, 2013. Retrieved December 20, 2013. ^ Walt, Stephen M. Walt. "Better Fewer, but Better". Foreign Policy. Archived from the original on 2013-12-17. Retrieved December 20, 2013. ^ Walt, Stephen M. (September–October 2005). "Taming American Power". Foreign Affairs. Archived from the original on 2013-12-28. Retrieved December 20, 2013. ^ Walt, Stephen M. "The End of the American Era". National Interest. Archived from the original on 2013-12-28. Retrieved December 20, 2013. ^ Mayer, Michael. "Why does US foreign policy keep failing?". Institutt for Forsvarsstudier. Archived from the original on 30 December 2013. Retrieved 27 December 2013. ^ a b Walt, Stephen M. (26 December 2013). "The 2013 Stories that Never Were". Foreign Policy. Archived from the original on 2013-12-25. Retrieved 27 December 2013. ^ Walt, Stephen M. (1 December 1998). "The Ties That Fray: Why Europe and America are Drifting Apart". The National Interest. Archived from the original on 2013-12-31. Retrieved 27 December 2013. ^ a b c d e Walt, Stephen (March–April 2004). "The Imbalance of Power". Harvard Magazine. Archived from the original on 2012-11-10. Retrieved November 16, 2012. ^ a b Stephen M. Walt (February 9, 2015). "Why Arming Kiev Is a Really, Really Bad Idea". Foreign Policy. Archived from the original on 2015-10-16. Retrieved October 12, 2015. ^ Keck, Zachary. "The Interview: Stephen M. Walt". The Diplomat. Archived from the original on 2013-12-30. Retrieved 27 December 2013. ^ Epps, Josh. "Point of Inquiry for July 28, 2015". pointofinquiry.org. Center For Inquiry. Archived from the original on 2015-09-05. Retrieved September 3, 2015. ^ Walt, Stephen. "On Dual Loyalty Archived 2017-03-08 at the Wayback Machine", Foreign Affairs (April 2, 2010). ^ a b Satloff, Robert (8 April 2010). "Defending Dennis Ross". Foreign Policy. Archived from the original on 2015-05-18. Retrieved 27 April 2015. A copy of the Satloff piece is available here Archived 2015-05-18 at the Wayback Machine via the website of WINEP. ^ Walt, Stephen M. (13 March 2011). "On the murders at Itamar". Foreign Policy. Archived from the original on 2014-01-14. Retrieved 31 December 2013. ^ Ini, Gilead. "Yet Another Stephen Walt Falsification". Camera: Committee for Accuracy in Middle East Reporting in America. Archived from the original on 2014-01-14. Retrieved December 31, 2013. ^ Werman, Marco. "Skepticism over Iranian Terrorist Plot". PRI. Archived from the original on 2014-01-04. Retrieved 3 January 2014. ^ Keck, Zachary. "The Interview: Stephen M. Walt". The Diplomat. Archived from the original on 2013-12-30. Retrieved 3 January 2014. ^ "Stephen Walt on Libya". The Wall Street Journal. 24 Feb 2011. Archived from the original on 2014-01-10. Retrieved 5 January 2014. ^ Berstein, David (6 March 2011). "Stephen Walt on Libya". Volokh Conspiracy. Archived from the original on 2014-01-06. Retrieved 5 January 2014. ^ Peretz, Martin. "Is Stephen Walt Blind, a Complete Fool, or a Big Liar?". New Republic. Archived from the original on 2014-01-06. Retrieved 5 January 2014. ^ Walt, Stephen M. "Weapons Assad Uses Shouldn't Affect U.S. Policy". The New York Times. Archived from the original on 2014-01-21. Retrieved 7 January 2014. ^ Olmert, Dr. Josef (9 Sep 2013). "Stephen M. Walt, Joseph Kennedy III, Syria and Israel". Huffington Post. Archived from the original on 2014-01-07. Retrieved 7 January 2014. ^ a b "More support for offshore balancing". Foreign Policy. Archived from the original on 2012-10-31. Retrieved 2012-11-16. ^ "Tom Friedman Sees the Light". Foreign Policy. Archived from the original on 2012-11-27. Retrieved 2012-11-16. ^ "What's the United States Up To in Asia? | Stephen M. Walt". Walt.foreignpolicy.com. Archived from the original on 2012-11-04. Retrieved 2012-11-16. ^ "Is IR like music or like sports?". Walt.foreignpolicy.com. Archived from the original on 2012-11-04. Retrieved 2012-11-16. ^ Keck, Zachary. "The Interview: Stephen M. Walt". The Diplomat. Archived from the original on 2013-12-30. Retrieved 8 January 2014. ^ Harrison, Ewan. The Post-Cold War International System: Strategies, Institutions and Reflexivity. Retrieved 10 January 2014. ^ Walt, Stephen M. "Snowden deserves an immediate presidential pardon". Financial Times. Retrieved 12 January 2014. ^ Walt, Stephen M. The Origins of Alliances. Cornell University Press. Retrieved 12 January 2014. ^ Walt, Stephen M. (6 March 1997). "Revolution and War: Cornell Studies in Security Affairs". Cornell University Press. Archived from the original on 2014-01-16. Retrieved 12 January 2014. ^ Walt, Stephen M (17 Sep 2006). "Taming American Power: The Global Response to US Primacy". W. W. Norton & Co. Archived from the original on 2014-01-16. Retrieved 12 January 2014. ^ Lieven, Atol. "'Taming American Power': Not Bad Nation". The New York Times. Retrieved 12 January 2014. ^ Mearsheimer, John and Walt, Stephen. "The Israel Lobby and U.S. Foreign Policy", JFK School of Government, Working Paper RWP06-011 (March 13, 2006). The JFK School of Government reportedly removed its logo from this working paper. See Rosner, Shmuel. "Kennedy School removes its logo from lobby 'study'", Rosner's Blog, Haaretz (May 10, 2006). ^ John Mearsheimer; Stephen M. Walt (23 March 2006). "The Israel Lobby". London Review of Books. Archived from the original on 2014-01-15. Retrieved 2014-01-12. ^ Mearsheimer, John and Walt, Stephen. "Unrestricted Access", Foreign Policy (May/June 2006). ^ Hitchens, Christopher. "Overstating Jewish Power". Slate. Archived from the original on 2014-02-18. Retrieved 12 January 2014. ^ Of Course There Is an Israel Lobby Archived 2016-11-23 at the Wayback Machine, Pittsburgh Post-Gazette, April 6, 2006. ^ "Rebecca Stone Is Wed to Stephen Walt". The New York Times. 5 May 1991. Archived from the original on 2011-01-29. Retrieved 18 December 2009. ^ "Home". Rebecca Stone for State Rep. Archived from the original on 2018-09-04. Retrieved 2018-09-04. ^ "Stephen Walt's Curriculum Vitae" (PDF). Harvard Kennedy School. Archived (PDF) from the original on 2011-02-23. Retrieved 9 June 2010. John Joseph Mearsheimer is an American political scientist and international relations scholar, who belongs to the realist school of thought. He is the R. Wendell Harrison Distinguished Service Professor at the University of Chicago. Samantha Jane Power is a British-born Irish American academic, author, political critic and diplomat who served as the 28th United States Ambassador to the United Nations from 2013 to 2017. She is a member of the Democratic Party. Walter Russell Mead is an American academic. He is the James Clarke Chace Professor of Foreign Affairs and Humanities at Bard College and previously taught American foreign policy at Yale University. He was also the Editor-at-Large of The American Interest magazine. Mead is a columnist for The Wall Street Journal and a scholar at the Hudson Institute. Alan Morton Dershowitz is an American lawyer and academic. He is a scholar of United States constitutional law and criminal law and a noted civil libertarian. He began his teaching career at Harvard Law School where, in 1967, at the age of 28, he became the youngest full professor of law in its history. He held the Felix Frankfurter professorship there from 1993 until his retirement in December 2013, and has been a regular media contributor, political commentator, and legal analyst. He is also a prominent voice on the Arab–Israeli conflict and has written a number of books on the subject. Martin Sean Indyk is a diplomat and foreign relations analyst with expertise in the Middle East. In addition to serving in academia and as adviser to political administrations, he is now the executive vice president of the Brookings Institution in Washington, D.C. He took leave from the Brookings Institution to serve as the U.S. Special Envoy for Israeli–Palestinian Negotiations from 2013 to 2014. The Israel Lobby and U.S. Foreign Policy is a book by John Mearsheimer, Professor of Political Science at the University of Chicago, and Stephen Walt, Professor of International Relations at the Kennedy School of Government at Harvard University, published in late August 2007. It was a New York Times Best Seller. The Israel lobby is the diverse coalition of those who, as individuals and/or as groups, seek to influence the foreign policy of the United States in support of Israel or the policies of the government of Israel. The lobby consists of secular, Christian, and Jewish-American individuals and groups. 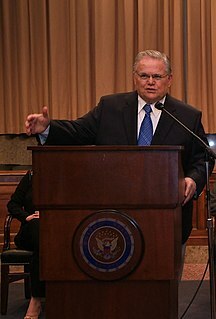 The largest pro-Israel lobbying group is Christians United for Israel; the American Israel Public Affairs Committee (AIPAC) is a leading organization within the lobby, speaking on behalf of a coalition of American Jewish groups. The anti-Israel lobby is a term used by some who criticize those groups and individuals that oppose Israeli policies or United States foreign policy which they consider to be too favorable towards Israel. Those opposed to such policies state that they seek a more "even-handed" U.S. approach to the conflict in the Middle East. William B. Quandt is an American scholar, author, professor emeritus in the Department of Politics at the University of Virginia. He previously served as senior fellow in the Foreign Policy Studies Program at the Brookings Institution and as a member on the National Security Council in the Richard Nixon and Jimmy Carter administrations. He was actively involved in the negotiations that led to the Camp David Accords and the Egypt–Israel Peace Treaty. His areas of expertise include Algeria, Egypt, Israel, Palestine, the Israeli–Palestinian peace process, and U.S. foreign policy. The Arab Lobby: The Invisible Alliance That Undermines America's Interests in the Middle East is a book written by Mitchell Bard, the head of the American-Israeli Cooperative Enterprise and the director of the Jewish Virtual Library, published in August 2010. It was written in response to John Mearsheimer and Stephen Walt's bestselling albeit controversial The Israel Lobby and U.S. Foreign Policy, which focused on the role of the Israel lobby in shaping U.S. foreign policy in a pro-Israel direction. The Hell of Good Intentions: America's Foreign Policy Elite and the Decline of U.S. Primacy is a book by Stephen M. Walt, which focuses on the foreign policy of the U.S. Government. According to the Belfer Center for Science and International Affairs, Walt unveils the reality of White House foreign policy and argues that past U.S. presidents such as Clinton, Bush and Obama, avoided accountability for repeated failures of their foreign policies. He also argues that such foreign policy mistakes contributed to the election of Donald Trump as president. In the book, Walt offers his take on what U.S. foreign policy should be and suggests that U.S. politicians should change their foreign policy approach.